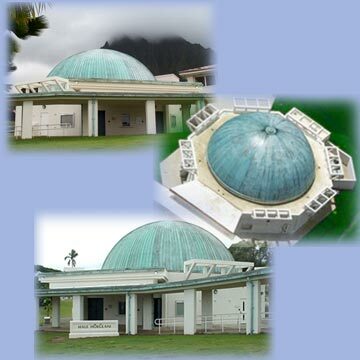 Hawaiian for Starry Heavens, Windward Community College's Hokulani Imaginarium is a high-tech planetarium and multi-media facility. Read more about the WCC Imaginarium here. For school group visit information, click here. School and other groups can select from the Imaginarium's complete listing of shows for their visits. Please click on the links below for show descriptions. For more information on scheduling group visits, click here. 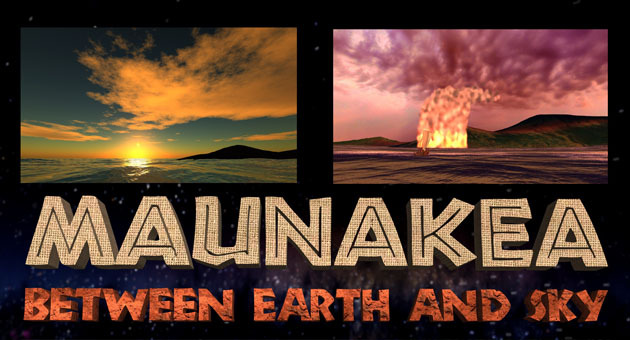 The Hokulani Imaginarium operates with a Definiti 4K fulldome system from Sky-Skan. DigitalSky 2 technology allows audiences to experience immersive adventures in a true 360° environment. Viewers feel like they are part of the unfolding scene, whether it is falling through a black hole, flying through Saturn’s rings or witnessing the beginnings of the universe. The upgraded projection system can also display 3D stereo images. This fulldome system fills the planetarium's screen with high-resolution images that are eight times sharper than HDTV. Two JVC SH7 projectors hidden behind the dome provide a high-contrast seamless picture. All Imaginarium shows, with the exception of Led Zeppelin, Pink Floyd, Sounds of the Underground musical shows, and Voyages of the Starship Discovery contain a live sky segment in addition to the feature show. Programs run approximately 1 hour in length. Trailers and full show descriptions for some of the shows can be found by clicking on show's poster image below. Teachers - Expedition Reef references NGSS: 2-LS2 and 4, 2-ESS2, 3-LS1-4, 3-ESS3, 4-PS3 and 4, 4-ESS2 and 3, 4-LS1, 5-PS3, 5-ESS2 and 3, MS-LS2 and 3, and MS-ESS2 and 3.
specifically for full dome theaters. understood the Universe throughout their history. The visuals are stunning, giving the viewer the impression of being inside a beautiful stylistic painting. 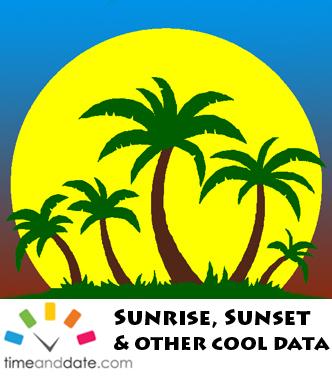 Teachers - This show supports NGSS: 3-ESS2, 4-ESS1 and 3, 5-ESS3, MS-ESS1. spectacular space environments to humorous pop-up books. Join scientists who are investigating the boundary between our Solar System and the rest of our galaxy. This show follows the creation of NASA's Interstellar Boundary Explorer (IBEX). Students will get an in-depth look at the mission and how IBEX is collecting high-speed atoms to create a map of our Solar System's boundary. Narrated by two inquisitive teenagers, audiences will hear from the scientists and engineers that developed the IBEX mission and created the spacecraft, and get the latest updates on the mission's discoveries. Join veteran presenter/storyteller Krissie Kellogg on the second Wednesday of each month as she takes you on a delightful tour of the constellations in the Imaginarium skies. Stay informed as the stars, planets and moon change as they move through space and learn about current events happening in the night sky as well as in space exploration! Discover the mystery of flight with Leonardo da Vinci, Montgolfier brothers, Wright brothers, and other inventors. Experience the adventure of achieving the immense and challenging dream of flying, with the program's powerful imagery and music. Dream to Fly was made possible by the generous donation of Dr. Jacqueline Maly through the Imaginarium’s Adopt-a-Show sponsorship. One World One Sky: Big Bird's Adventure was made possible by the generous donation of the Iris and Rodney Fukui Family through the Imaginarium's Adopt-a-Show sponsorship. Based on the popular children's Magic Tree House® books, a mysterious “M” sends the intrepid Jack and Annie on a fun-filled journey to discover the secrets of the Sun, Moon, planets, space travel and more. Husband and wife authors Mary Pope Osborne and Will Osborne collaborated to produce this planetarium based program, popular with Magic Tree House® fans of all ages. Presented in stunning high-definition fulldome video and surround sound, Astronaut is an experience like nothing on Earth! Narrated by Ewan McGregor. 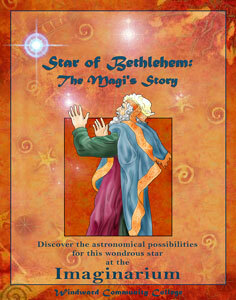 Written and produced by Imaginarium Director Dr. Joseph Ciotti and narrated by Hawaii radio personality Billy V, Star of Bethlehem: The Magi's Story explores some of the astronomical possibilities for the star that guided the Wise Men to Bethlehem. The show recounts the story of the Magi - who they were, where they came from and why a star could so entice them to embark on a journey to a distant kingdom. A visually rich show about the darkest and coldest time of the year that explains the seasons and the origins of many of the world's most enduring customs from Christmas trees to the Hanukkah Menorah, Santa and the Star of Bethlehem. Earth, Moon and Sun is a fulldome Imaginarium show that explores the relationship between the Earth, Moon and Sun with the help of Coyote, an amusing character adapted from Native American oral traditions, who has a razor sharp wit, but is a bit confused about what he sees in the sky. Join this fast-paced and fun-filled show as it explores the wonders of lunar phases, sunrises and sunsets, eclipses, space travel to our Moon and other puzzles. Native American stories are told throughout the show to help distinguish between myths and science. This Imaginarium show recreates the splendor of Maya architecture and astronomy. Grammy Award winner and Oscar nominee Lila Downs narrates this magnificent journey through Maya cities and temples aligned to the movements of the Sun, Moon and planets. Teachers – Tales of the Maya supports NGSS: 3-ESS2, 4-ESS1 and 3, 5-ESS3, MS-ESS1. This returning favorite is a skillfully woven tapestry of star tales and Native American legends, combined with constellation identification, star-hopping and astronomy tidbits--all told from the unique viewpoint of a cowboy astronomer. Hosted by Sir David Attenborough, distinguished naturalist and broadcaster, this program uses amazing special effects to portray these airborne dinosaurs. Appropriate for anyone that loves dinosaurs!